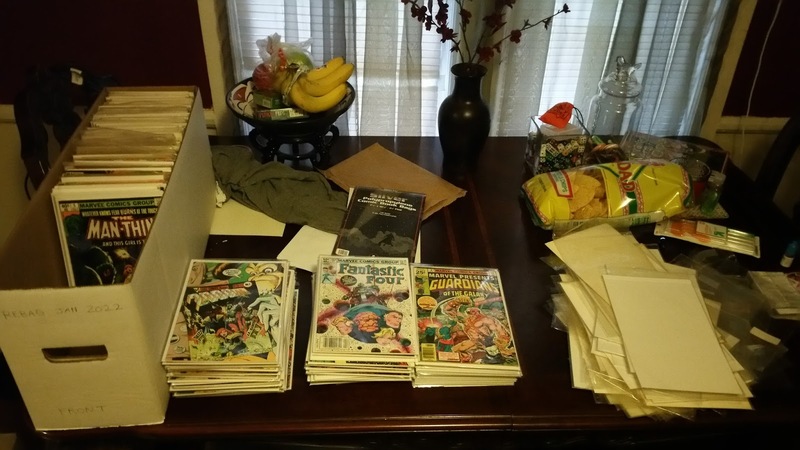 I swapped out the bags and boards on a hundred issues today (the three stacks in the middle) and have about four hundred more to go. This is not my favorite activity in the world and I don’t envy anyone with a bigger collection… well, I do, but not when it comes to doing this. On the bright side, I shouldn’t have to do this again until 2022, at which point I hope I have enough money to switch to mylar. I would tell you all about my key issues and prized possessions, but I just collect what I liked when I was a kid and what I would have liked as a kid. 2000 AD, EC horror and science fiction reprints, Jack Kirby, Steve Gerber, Marvel’s What If…?, stuff like that. Mostly silver and bronze here and these days I rarely buy anything if I can get it digitally. So yeah, I probably won’t post much this week, but I do have plans for Western Wednesday this week and next.